Everyday, our people are stolen from their beds in the wee hours of the dawn and secretly assassinated by Nigeria DSS and the mafia Police. This is therefore a notification to the concerned communities of the world to observe the deadly annihilation of a race on-going in Nigeria. Our crime is the exercising of our fundamental right by asking to be let go of a suffocating union illegally created and included without mutual agreement or permission. Everyday, they falsify our Intentions with irritating nicknames like Militants, Terrorists or Agitators, this is all wrong. We have committed no crime in demanding for our rights. Can a father give his son snake if he asked bread? No way! It is therefore glaring that the Nigerian government is no father figure but a kidnapper, only selfishly looking out for gains and is ready to extinct a whole people just to lay a filthy, cursed and blood-filled hand on her wealth. They, therefore connived with telecommunication networks to tamper with their customer's (our) privacy by tracking Biafrans through them, thereby secretly abducting and executing their 'victims'. Why on earth will a telecom company invade the privacy of their customers? Why has MTN sold her corporate values to the Nigerian corruption? Well, your hidden agenda is now public. You are instrumental to our people's silent massacre. Now, we will boycott your network. You will definitely lose our patronage. Biafrans do not mingle with traitors. Who are the terrorists now? Those condemning bombing of oil installations, what do you have to say about the dehumanizing conditions of the Indigenous People of Biafra? Killing with impunity has become a norm since Mr. Change took over. Genocide upon genocide, yet my people remain defenseless. Here is a call to boycott MTN and any other network involved in trafficking our trust in them. We are committing no crime, BIAFRA is our right. This is not the time to lose hope, or become discouraged but time to beat your chest and stand out for our father land. We, as warriors must withstand the tide like soldiers in the war front and activate our thinking faculties to quick responses. Fear kills more than DEATH. Crucify your fears, nail your doubt to her cross and resurrect as immortals to Nigerian wickedness. Be immunized against her cruelty. We are survivors and must not allow ourselves to be drowned by her. We must keep hitting until we get our target. Rome was not built in a day, but she was definitely built. Biafra is not a product or ware to be purchased. She is not a harlot with a price tag. Biafra is not a naughty child to be punished. She is definitely not a spouse to be divorced. 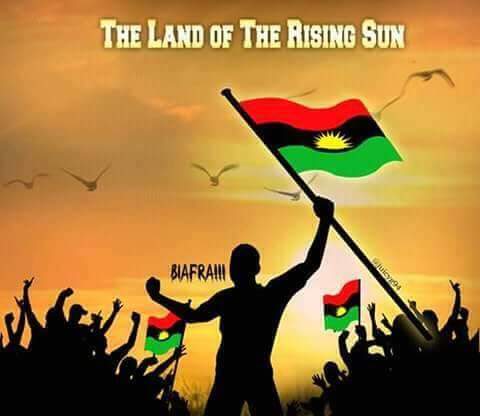 Biafra, is a race to be reckoned with. She is a people with soul, mind and body; intellectuals with potentials and capabilities. She is a beautiful bride to be crowned when the sun rises in her. Her beauty knows no bounds and all she craves is to be embraced by her people but like kites and eagles, the federal government of the British-born Nigeria constantly and continuously threaten her existence. IPOB is not a terror group but Indigenous People fighting for their rights. Take note!